Everead: Happy Book Bloggers Appreciation Week! 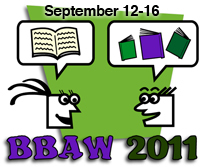 This week is Book Blogger Appreciation Week! Seriously. I'm not making this up. There are prizes for book bloggers and special topics you can post about and tomorrow I'm being interviewed and doing an interview in return! It's all so exciting. Reading Shannon Hale's blog, Stephenie Meyer's blog (which no longer exists), and participating on the forums at the Twilight Lexicon (ah, saying that makes me feel nerdy, it has been a long time) got me thinking about books online. "Wait. There's an online book community?" I said to myself. After finding interesting information on their books, I started to look up other books online. The first book blog I began to follow was Bookshelves of Doom. Leila of Bookshelves of Doom embedded a vlogbrothers video, and while they're not strictly book bloggers (or book vloggers) they are doing a Great Gatsby discussion these days. I do believe I have watched every one of their videos. I have been more faithful to their YouTube channel than to any television series. Many thanks go to Shannon Hale for highlighting Laini Taylor; I've followed her from Not For Robots to Grow Wings to her current blog. Then I was a Cybils judge, and I got all kinds of new favorite blogging connections from that! Melissa over at Book Nut remains a standout, and I can't help loving Sherry at Semicolon. And that's the way these things happen -- one blogger introduces you to another and suddenly your reader (google reader, in my case) is filled with all kinds of awesome author blogs and book blogs, and you have a conglomeration of friends you've never met. People whose lives you get to peek into. People whose taste in books is exactly like your own, crazily different, or to be taken with a grain of salt. I'm glad to be part of it. p.s. I finished reading Jane Eyre yesterday. Love it! p.p.s. Permission to appreciate Everead in the comments? Granted. This post sounds kind of familiar. Oh, yeah, it's because it's my story too! Ha! :) Okay, not all of it, but a lot of it. I just found your blog and am realy excited about it. I'll be checking out all the blogs you linked to today. Thanks!